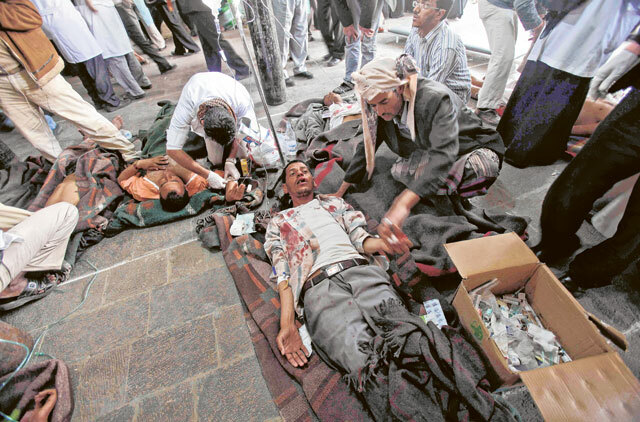 Sana'a: Two more anti-regime protesters died in Yemen on Sunday, a day after police shot them in the head, raising the death toll to seven from demonstrations against President Ali Abdullah Saleh. 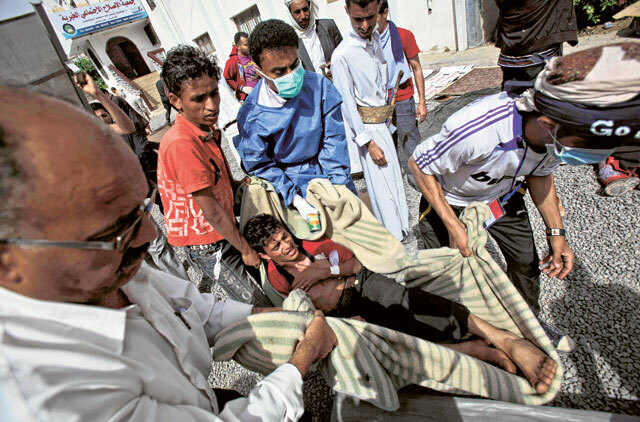 The two succumbed to wounds after "being shot in the head" in the southern city of Aden, a medic said, adding four other demonstrators were in a critical condition after also being shot in the head. 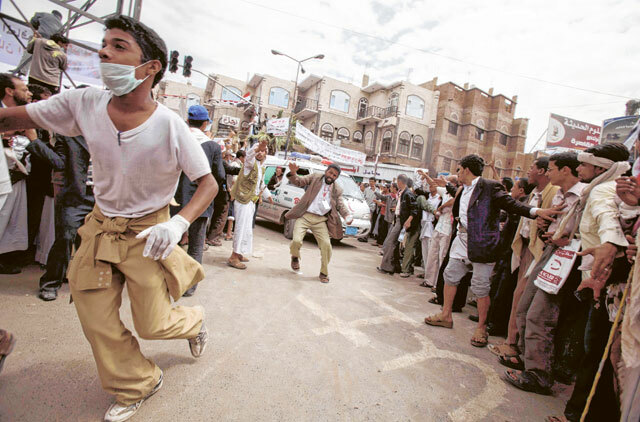 On Saturday, five protesters including a schoolboy were killed in fresh bloodshed in Yemen. Yemeni police on Saturday shot dead a schoolboy who was taking part in anti-regime protests in the southeastern city of Mukalla, medics and witnesses said. The 12-year-old boy was shot as police fired live bullets to disperse a demonstration of hundreds of school pupils which started in Fowa neighbourhood, witnesses said. The protest came as students across the country took to the streets in response to a call for civil disobedience at schools on Saturday, after more than a month of anti-regime protests. Earlier in a dawn raid, at least one person was killed and scores injured when security forces used water cannons, tear gas, and live bullets to prevent protesters from setting up more tents around the university area, witnesses said. The security forces targeted the new tents that were set up on Friday before and after the Friday sermons. More protesters set up new tents beyond the concrete barriers set up by the police. “Some protesters in new tents are still surrounded and armed tribesmen are on their way from Hamdan and Amran areas to rescue us,” said Abdul Rehman Al Kubati, one of the protesters in the media committee, from his tent close to the gate of the university. On Friday, at least three people were injured in clashes between anti-regime protesters and owners of houses close to sit-in tents at a university neighbourhood in the Yemeni capital Sana'a, said residents and protesters late Friday. The number of protest tents have increased and extended beyond concrete barriers put a few days ago by the police to prevent any increase in tents. Some residents have successfully built walls to prevent protesters from entering their neighbourhoods. "Closed for the sake of calm" is written on one such wall near the Al Qadisyah traffic circle. Some residents living near Al Rebat street were also successful in convincing protesters not to erect tents close to their houses. "We agreed not to set up tents but in return they will not build walls," said Najeeb Abdul Rehman, a 28-year-old protester. "They were telling us: we do not want our women to be searched when they come and go and we agreed because we know the Yemeni society and it's social sensitivities." The tents increased on Friday as about 50,000 worshippers, who wanted to show their support, were attending Friday sermons in the university neighbourhood, dubbed Change Square by the protesters. Surprisingly, the tents of the supporters of President Ali Abdullah Saleh in the city's main square have also increased over the last few days in Tahrir. Several roads were blocked because of the new tents. Thousands of Saleh's supporters also attended Friday sermons in Tahrir. This Friday was different from almost all the previous ones in terms of the number of those on the streets, either anti- or pro-regime, and also in terms of the general atmosphere of tension and fear. It came a day after President Saleh offered his third initiative since the protests demanding his ouster started more than a month ago. Opposition figures said it is too late for initiatives now, and protesters in the streets completely refused it and insisted on Saleh's ouster. When Saleh announced his third initiative on Thursday, which called for a referendum on a new constitution during 2011, he said: "I'm sure the opposition will refuse this initiative as they did with the previous ones, but I'm announcing it to the people..."
It was understood by a lot of Yemenis and observers that Saleh was saying this is the last attempt and this is what all he has. More than 40,000 people, including tribal and religious leaders, came on Thursday from all over the country to support Saleh and listen to his last initiative. Many of those tribesmen joined the pro-Saleh protesters and installed new tents in Tahrir. And with more tribesmen from outside Sana'a joining both protests, and with more hatred against each other, the people in the capital have started to fear of a possible armed confrontations. Some people started to buy more food from the market and store them, and some have left Sana'a to the their villages and some are packing their belongings. "My village is much better than here, it's our safe haven for my children," said 50-year-old shopkeeper Saeed Murshid, father of eight girls and a boy. "I always remember my grandfather, who advised me not to live in Sana'a, he would always tell me Sana'a is very dangerous: people there are always fighting over power and the money," said Murshid, who was planning to return to his village with his family.